My family (well, my mother and father, my nephew, and myself - technically a small subset of my family) were on our summer vacation. For several years, it had been a yearly thing to trek to New England to visit my father's mother (in northern Massachusetts) and my mother's sister (in New Hampshire). Our standard routine was to spend a night at each relative's home, and the rest of the time at Hampton Beach. (The occasional day-trip to Boston was not unheard of.) This particular year, however, we took a day out of our week-long sojourn and went somewhere new: Salem, Mass. I was especially thrilled at this, because of my new-found love for the horror genre. (Which is why I think we're talking '85 - read the post linked above to see why.) I was still a bit naive, and I expected Salem to be some sort of creepy little hamlet, still darkened by its witch-haunted past. Of course, the real Salem was nothing of the sort. It was as modern and free of gothic horror as any other American city. (Nor had it yet become the witch-centric tourist destination it currently is.) I couldn't help but be disappointed. My nephew was also of a single purpose: to locate a book store stocking the works of some horror author of whom I'd never heard, and whose name I thought sounded a bit fruity. He had heard about this author from one of his school friends or something, and regardless of my dismissal of the subject was determined that he must find and read the man's works. After dragging my parents all over downtown Salem, we finally found a shop that filled both our needs. It was there that I purchased my first set of tarot cards, a Morgan-Greer deck (Oh, the forbidden delight of owning a legitimate piece of esoterica! Hey, I was a naive teenager - cut me some slack.) and my nephew purchased a thick, over-sized paperback bearing the title "Bloodcurdling Tales of Horror and the Macabre" on its cover in big red print. We returned to our hotel room that afternoon flushed with our conquests. On our way home from New England I succumbed to boredom (the back seat of a Camaro can be a tough place to be for more than a few hours at a stretch) and my curiosity finally got the better of me. I broke down and asked my nephew if I could read his book while he dozed. I cracked open the paperback and flipped through it. Not being and avid reader at the time, and unsure of what to expect from this unfortunately named "H.P. Lovecraft," I looked for something relatively short. I don't recall why, but I settled on "Pickman's Model." Even though my love of the horror genre bloomed in 1985, I had harbored a fascination for it for years, despite my sensitive nature. (Again, see the linked post in the first paragraph.) I can recall being drawn to scary movies as far back as I can remember - I even recall choosing horror comics to read when visiting a family friend's house, despite the wide selection of choices presented in the stacks and stacks of comics her son had collected. To this day, I don't exactly know how Lovecraft slipped under my radar for so long. To some extent, I lament not having become aware of him sooner - at least by a few years. 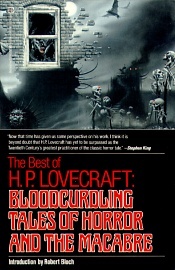 Granted, '85 was probably the best year for me to discover HPL's works, given my new-found love. But I feel I missed out on a lot by not being privy to the early-80's Lovecraft "movement" - such as: the earlier editions of Call of Cthulhu and their classic supplements; Grenadier's characterful CoC miniatures, which I now find myself purchasing used or as Mirilton recasts at exorbitant prices; and publications like Crypt of Cthulhu - issues of which I would love to purchase, but haven't the capital to do so, thanks to their high second-hand cost. I suppose I should be thankful for discovering H.P. Lovecraft when I did, since it was probably the most opportune time in my personal development to do so. 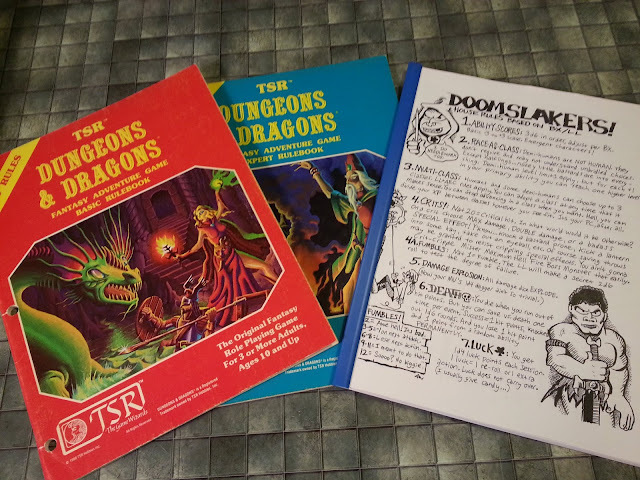 But, as with discovering Dungeons & Dragons in '81, I can't shake the feeling that I missed out on something special by not doing so just a few years earlier. Thanks for sharing! I discovered HPL in the mid-80s too. I remember a friend suggested him to me by saying that a classmate had slept on his parents bedroom floor, he had been so scared. I just had to see what had made the stories so scary. BTW my first HPL story was The Lurking Fear - one of his scariest I think. "The Lurking Fear" was also one of my first (The Lurking Fear and Other Stories being the first collection of HPL stories I purchased after reading many from my nephew's book) and has to be among my top five favorite HPL stories. It was certainly one of his creepier pieces, thanks mostly, I think, to the fates of the protagonist's companions - especially those who slept with him the Martense mansion. "Into the mountains of Madness" is going to be a film, directed by Guiermmo DeTorro of Hellboy/Pan's Labrynth fame. Pickman's Model was also my first introduction to Lovecraft's works.